I did something that I’ve never done before, and that’s see a film the night before. I didn’t do a midnight showing of the new Tom Cruise flick, Edge of Tomorrow, because I currently write to you at midnight. Hollywood has started to realize that folks don’t care to do the midnight showings of films as they use to due to the fact that it’s late and nobody really cares to drive at 2 in the morning. So while they still offer the midnight showings, they also do 8 P.M. showings as well, and this was one of those showings. I’d been cautiously looking forward to Edge of Tomorrow, as it had some really terrific talent both in front of and behind the camera, but it did look similar to the fare that Cruise had been pushing out as of recently, with the trailers looking very similar to last year’s Oblivion, also staring Cruise, which a lot of people didn’t care for (I was in the minority that enjoyed the film quite a bit). But the reviews started coming in for the film, and the response has been very enthusiastic and positive. So, I decided what the hell, I’d go see the film with my friend this evening (even though we missed Game 1 of the Spurs kicking the crap out of the Heat!) and we saw Edge of Tomorrow. Here’s the review. Tom Cruise plays a man named Major Bill Cage, whose essentially the PR guy for the military. He is swept up in this massive invasion of an alien race that is quickly taking control of Europe. Cage, who has no combat experience, gets thrown into the battle and dies almost immediately. However, he wakes up, and he ends up finding himself repeating the same day of him dying during this battle that’s almost un-winnable. While he continues to die and die in this battle, he finds himself with a woman named Rita, played by Emily Blunt, who happens to be the poster woman of these giant mec suits that the military now wears, and she understands what Cage is going through. Together, they both try to figure out what is going on, and try and save humanity, and what’s left of it. The film was directed by Doug Liman, whose best known for director The Bourne Identity, Mr. and Mrs. Smith, and one of my favorite films, Swingers. And the script was co-written by frequent Cruise collaborator Christopher McQuarrie, who will be directing Cruise in next Christmas’ Mission Impossible 5. Liman is a great action director, and McQuarrie is an Oscar winner who knows his way around a good script. And this ends up being the scenario with Edge of Tomorrow, as everyone involved come together to make an extremely entertaining and exciting summer film that may as well be the best blockbuster of this summer by far. Granted, the film will have a hard time making it’s money back since it’s opening against the film The Fault in Our Stars. I’m not sure why that’s the case, but I’m not a teenage girl, so I couldn’t tell you. But what I can tell you is that you must go see Edge of Tomorrow this weekend, and let me tell you why. Tom Cruise is, of course, fantastic in this role. Whatever your thoughts may be on Cruise’s latest films, we can all agree that no matter the film, Cruise puts his all into the roles given to him. He brings his trademark intensity to the role, along with that confidence and charm he’s had for years. What was a nice surprise to the film was that McQuarrie was able to sprinkle a good deal of humor into the script, and it works very well. The gimmick of this day being repeated over and over again for Cruise’s character is done very well, and there are some pretty neat and witty visual gags that the filmmakers come up with during the film. Emily Blunt is also really terrific in her role, and she can actually hold her own against Cruise and the rest of the actors on screen. Blunt has always had this incredibly charming quality about her in her work, and her chemistry and scenes with Cruise are easily some of the best parts of the movie. You also get some good albeit brief supporting performances from actors like Bill Paxton and Brendan Gleeson, but the time they’re in the picture, they do their job and they do it well. Paxton is very good as a southern Seargent whose in charge of Cage during this ill-fated mission. But the film is mainly Cruise and Blunt throughout most of the film, with Cruise’s army division in the film having some good little laughs here and there. But what I was mainly impressed by with in this film was the action, and how it was staged and represented. Liman comes from the Bourne franchise where the camera work feels gritty and realistic without it ever feeling nauseating or annoying. As I said earlier in the review, Liman and company use some pretty cool tricks to use the repeating of time to a near perfect result, as the action never feels like too much or too little. The action with the massive mec suits that these military guys have on with their big artillery is big and showy and very exciting to watch. The action sequences in the film are just breathtaking to watch, including the finale which I won’t give away. If I had some complaints with the film, it would be that some of the sequences with Cruise’s division didn’t really feel that funny, and the humor felt forced and pretty lame. I would have also liked to have seen more of Brendan Gleeson in the film, just primarily because he’s one of the finest character actors working today. But for what it’s worth, Edge of Tomorrow was pretty fricking awesome. The film never skips a beat, it never drags or feels too long, and the action is exciting and big. It’s also the best Tom Cruise film since 2011’s brilliant Mission Impossible: Ghost Protocol, which in my opinion, Edge of Tomorrow surpasses Ghost Protocol. It’s a damn shame that the kids are gonna go see some film about cancer (I’m pretty sure that’s not the plot, I don’t really care to do any research about The Fault in Our Stars, because I’m lazy and and it’s getting late). But Edge of Tomorrow may possibly be my favorite film of 2014 by far in general, for both the mainstream and indie block. But then again, Boyhood was pretty swell, and I’ll luckily be able to revisit that gem in July when that’s released. I highly recommend you go check out Edge of Tomorrow this weekend, and then the next weekend we have 22 Jump Street coming out, which I’m very much looking forward to. Sounds good Jake. I’ll have to check it out this week. Great review, Jake! 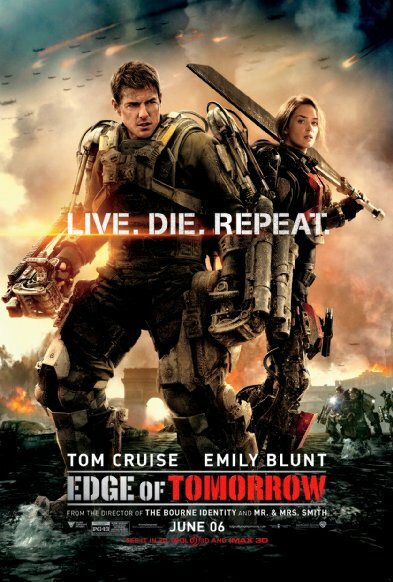 I agree, it’s a shame that Edge of Tomorrow is underperforming right now, I really enjoyed it. Great review Jake. My only complaint is the casting of Emily Blunt as Rita. Before Edge of Tomorrow was a movie it was a Japanese Novella and a manga (Japanese comic series) called All You Need is Kill. In both Rita is described as a pretty brunette in her early to mid twenties, aka the kind of girl that shouldn’t be involved in a war. I felt they really messed this up with casting Blunt, but that’s just my opinion.